Super2 racer Todd Hazelwood says the depth of talent in the championship this year is among the best in the series’ history. After securing his maiden win at the season opening Clipsal 500, Hazelwood sits second in the points behind veteran campaigner Paul Dumbrell after three events. With five drivers taking wins in the opening three race meetings, the South Australian says the number of drivers able to compete for podium places has expanded this season. The current field includes former series winners Dumbrell and Garry Jacobson as well as Pirtek Enduro Cup co-drivers Jack Le Brocq, Macauley Jones, Jack Perkins and Richard Muscat. Will Brown and Anton De Pasquale have also finished on the podium this year while Andrew Jones, Shae Davies, Renee Gracie and Kurt Kostecki all have main series starts to their names. “I think this year we’ve got a really strong top 10,” Hazelwood told Superacrs.com. “No disrespect to other years, but the depth of talent this year is really strong. “Once upon a time there was probably five to eight guys capable of a podium, now it’s probably up to 15. That really spices it up. “Obviously there’s probably two or three drivers on the podium round after round, but there’s been a few guys that have had bad luck. “I think going into the last part of the season there’ll be more surprises popping up. Hazelwood added securing his first win earlier in the season has given him confidence for the remainder of the season. The 21-year-old will also drive alongside Tim Blanchard for this year’s enduros and take part in the non-championship Bathurst races. “I didn’t realise how much a win could change my mental preparation and confidence going into round two,” he said. “It really did open my eyes a little bit and it’s certainly lifted the weight off my shoulders. “I suppose it rejuvenates the idea you can do it. I hadn’t won a race for a few years, since my Formula 3 days. “This sport thrives on confidence and if you’ve got that on your side you’ll do good things. “After the first win I got another in Tassie and we’ve been on track to get a couple more as well. 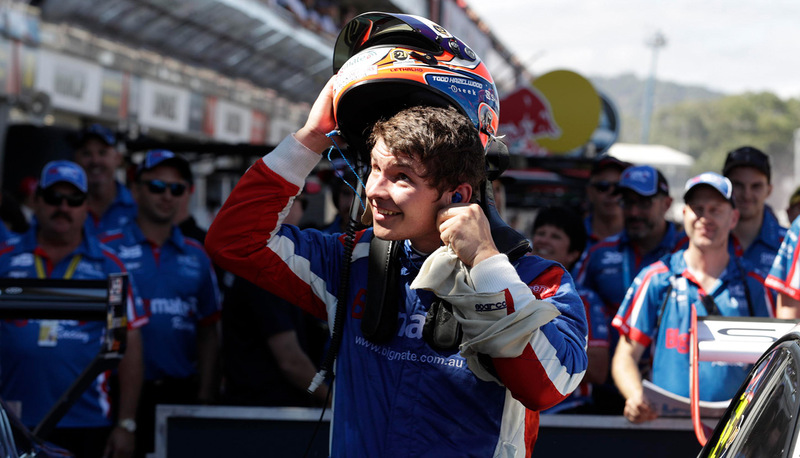 While series rivals Le Brocq, Macauley Jones and Davies took part in recent wildcard races in the Virgin Australia Supercars Championship, Hazelwood says he has been busy behind the scenes preparing for Townsville. “The season has been fantastic. Obviously we got our breakthrough win and we’ve had a consistent start to the year,” Hazelwood added. “The last round at Phillip Island didn’t really go to plan but that was more from my behalf, I made a couple of mistakes. You live and learn. “We’ve had two months since our last event so I’ve had a good chance to do a bit of evaluation of myself and how I can improve. “I’m looking forward to Townsville where we finished second last year; one better would be nice. "We’re second in the points at what’s almost the half-way point.